My Memphis Mommy: *HOT* Shelby Farms Starry Nights Half-Price Tickets! 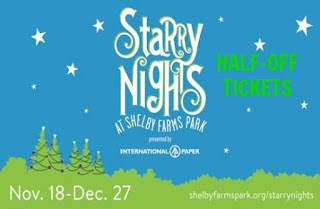 *HOT* Shelby Farms Starry Nights Half-Price Tickets! WOW! If you've been thinking about heading to Starry Nights at Shelby Farms this year, hurry over to Get My Perks today and grab half-price tickets before they sell out! Promotional value expires 12/27/16. Limit 1 ticket per purchaser; 1 additional ticket may be purchased as a gift. Valid only for 2016 Starry Nights. Tickets good for 1 car, minivan, or truck. Tickets can be redeemed at the VIP Entrance off Mullins Station Rd at Gate 10. Not valid toward purchases at Mistletoe Village, Starry Carriage Rides, or Starry Hayrides. Sales tax may apply to orders. A shipping and handling fee of $1.15 will be applied to all orders. No cash back; no cash value. Upon checkout, please indicate whether you would like your ticket(s) mailed to you or if you prefer to pick them up at the Get My Perks office at 1835 Moriah Woods Blvd, Ste 1, Memphis, TN 38117. Office hours are 8:30 am-5:30 pm, Monday-Friday. For more information, call the Get My Perks office at 901-384-5888.